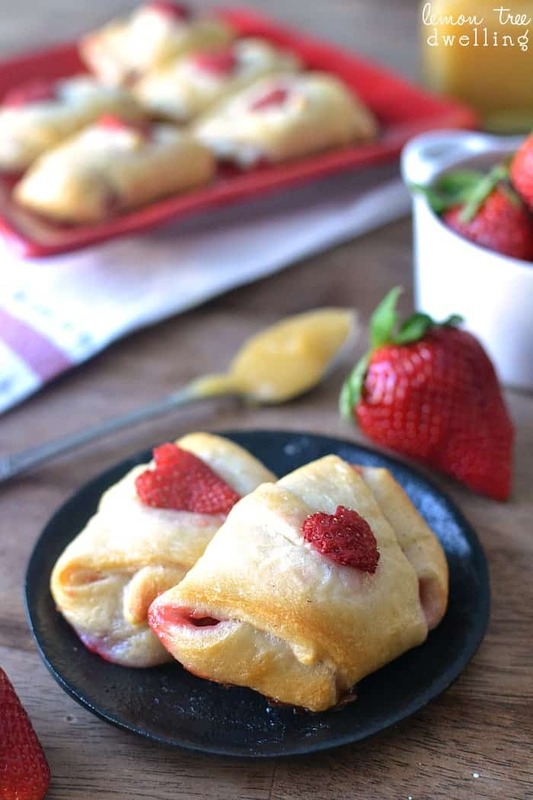 Strawberry Lemon Crescent Rolls are a great addition to your Sunday Brunch. 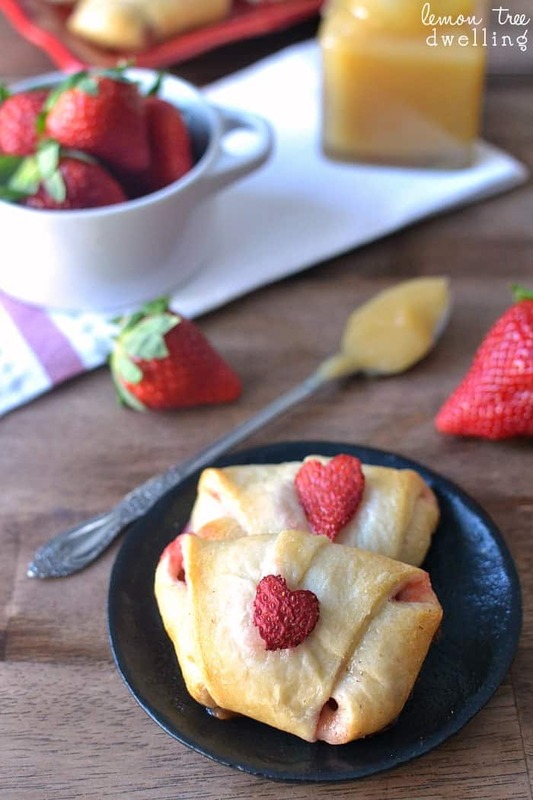 These soft, buttery rolls are filled with fresh strawberries and lemon curd – an easy dessert or sweet treat to share with everyone. What is it about holiday weeks that always feels so….BUSY!? Silly question, I know. I blame the kids. We try to make holidays feel special for them, and in the process, we may end up taking on a *little* too much. This week is a perfect example. In addition to the valentines that need to be addressed and the boxes that need to be decorated and the cookies that need to be made and the treats that need to be purchased for the party on Friday, there are gifts to think about and a date night to plan. Oh – and cupcakes to make for Greta’s half birthday treat! When it rains it pours, I guess. Which is exactly why I need to pull out the big guns….in other words, the crescent rolls! 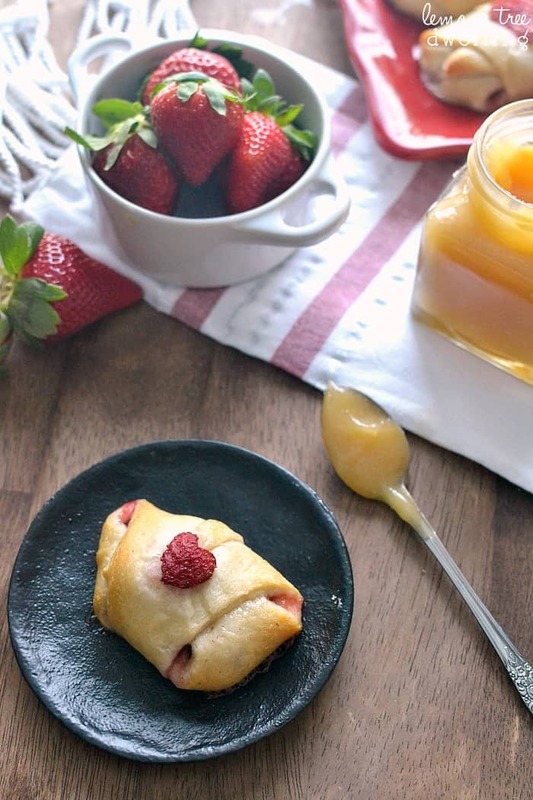 Not only are crescent rolls so fun and delicious….but the possibilities for them are endless! And they really are SO easy. 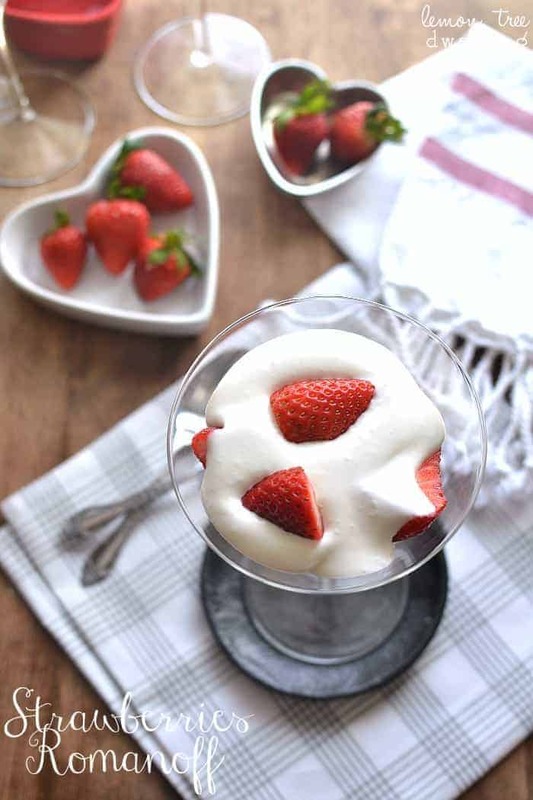 So you can get it all done – the valentines and the cookies and the date night and all – and STILL make a Valentine’s Day breakfast that’s extra sweet and special. 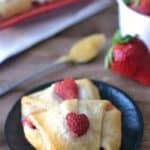 My kids have come to expect crescent rolls in one form or another for nearly every holiday, and who doesn’t love a strawberry-lemon combo? 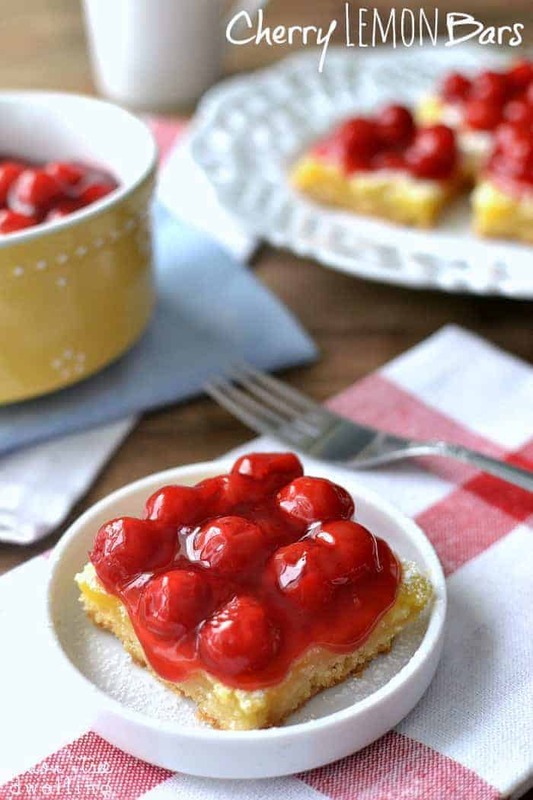 Especially when the strawberries are fresh and the lemon is lemon curd….and there’s a cute little strawberry heart on top? These little cuties are the picture perfect Valentine’s Day treat. And a great way for you to feel like super mom. Unroll crescent dough into triangles; fill each triangle with 1 heaping tsp. lemon curd and 3 slices of strawberry. *Reserve end pieces for strawberry hearts. Roll into crescent shape, tucking edges to prevent leakage. 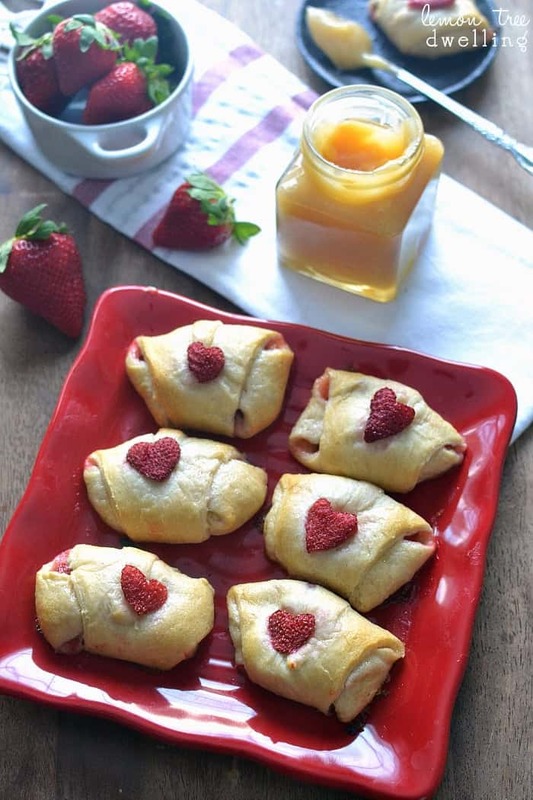 Cut strawberry ends into hearts; top each crescent roll with a heart. Bake on parchment paper-lined pan at 350 degrees 15-18 minutes or until golden brown. Serve immediately with additional lemon curd as desired. 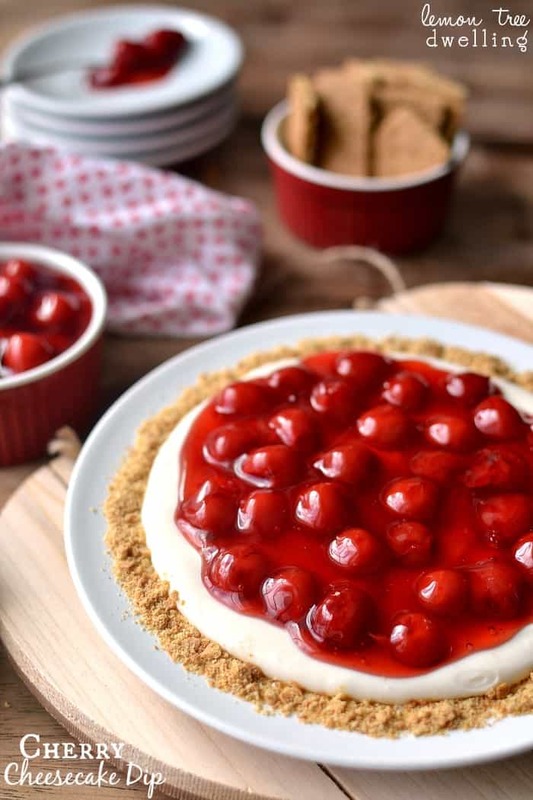 Still looking for some last minute Valentine’s Day recipes? Be sure to follow us on Facebook to keep up with all our trends and topics! Cathy! I needed to make something easy and yummy for Riley’s celebration – THIS IS IT! Less labor intensive than Sydney’s requested cake pops and a little more “grown up” for 5th grade. Thanks for sharing! BEST RECIPES as always! Oh and I agree – holiday weeks make things so much more busy than needed around here, especially with kids and school volunteering and celebrations! I swear to you I made almost exactly the same thing — it’s posting on Friday. ha! But you have LEMON CURD!! And I have Lemon Cream Cheese. So I think you win. These are so so so pretty Cathy! These are adorable! My kiddos would love them! 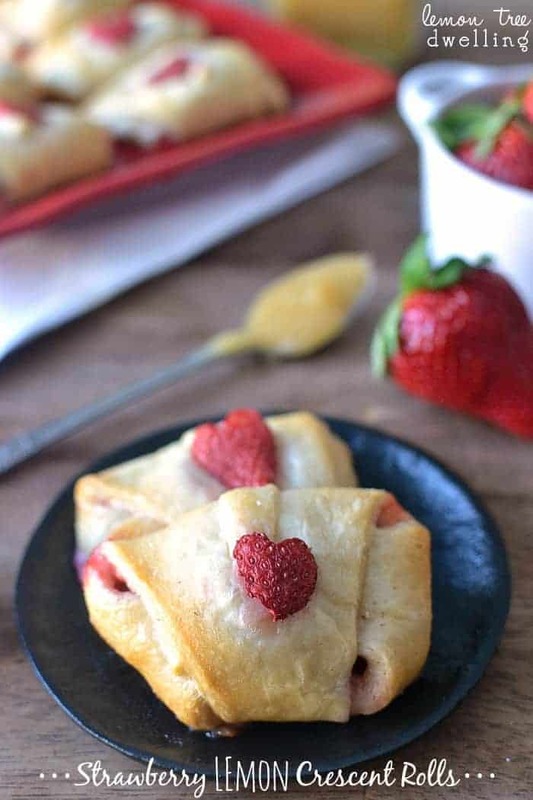 I am swooning over the strawberry hearts! Cathy, these are gorgeous! I love the strawberry and lemon combination. So easy to whip up and so delicious! Strawberry and lemon together rock! I love your crescent roll creations! Another great recipe!